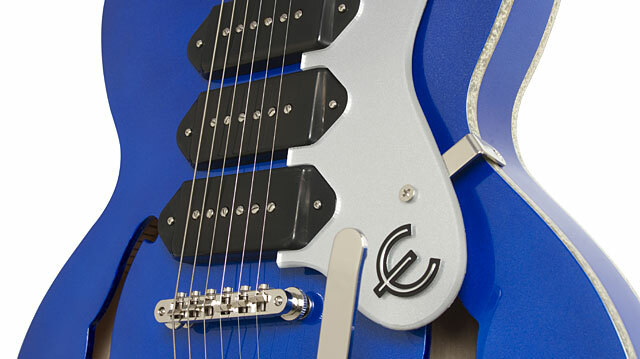 Epi’s P-90 Powerhouse with Bigsby® B70 in Chicago Blue Pearl finish! Epiphone presents the Ltd. Ed. Riviera Custom P93 Blue Royale with Bigsby® B70 tailpiece, one of six historic Epiphone models debuting a beautiful new Chicago Blue Pearl color finish along with the distinctive “Royale” style Silver Sparkle binding. Each Blue Royale instrument features superb Epiphone pickups and electronics along with the rock solid hardware you’ve come to expect from Epiphone. The Epiphone Riviera Custom P93 is modeled after one of Epiphone’s most enduring classics, the Riviera. First introduced in the early ‘60s, the Epiphone Riviera’s semi-hollow design has been a favorite of players from all genres and generations including blues great Otis Rush, Lou Reed of the Velvet Underground, and The Strokes’ Nick Valensi, who have all found that the Riviera’s legendary ES-body shape could produce great tones with any pickup variation. Over the years, the Riviera has been seen with humbuckers, mini-humbuckers, and P-90s. But now the Ltd. Ed. 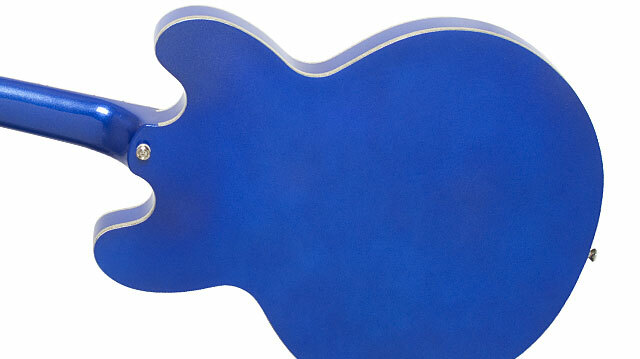 Riviera Custom P93 Blue Royale has the rare distinction of giving players a new sound and a striking new look. The Riviera Custom P93 Blue Royale has 3 Epiphone “Dogear” Alnico™-V P-90 pickups for a sonic punch that leaves all other three-single coil pickup guitars in the dust. And when matched with the bell-like tones of the ES-style body, a Bigsby® B70 tailpiece, plus a stunning Chicago Blue Pearl color finish and Silver Sparkle binding, the Ltd. Ed. Riviera Custom P93 Blue Royale instantly becomes a modern classic. Every Epiphone from the House of Stathopoulo comes with a Limited Lifetime Guarantee and Gibson 365/24/7 Customer Service. But the Ltd. Ed. Riviera Custom P93 Blue Royale is only available for limited time through Select Epiphone Dealers. So visit your nearest Authorized Epiphone Dealer today for details on the Ltd. Ed. Riviera Custom P93 Blue Royale and the entire Blue Royale Collection! The new Ltd. Ed. Riviera Custom P93 Blue Royale is constructed of premium laminated Maple with a Mahogany center block and is finished in beautiful Chicago Blue Pearl with a Metallic Silver pickguard with a famous 60s era “E”. The glued-in Mahogany neck is hand-set and has a 24.75” scale with a SlimTaper™ “D” profile, 22 medium jumbo frets, and a 1.68” nut for great string spacing and intonation. The fingerboard has a standard 12” radius and pearloid parallelogram inlays and is topped off with a ‘60s era Epiphone logo in script and “Crown” inlay on a Sloped Dovewing headstock. The Ltd. Ed. Riviera Custom P93 Blue Royale’s fabulous semi-hollowbody sound is powered by three Epiphone “Dogear” P-90 pickups with Alnico™ V magnets. Controls include 3 individual Volume pots (for each pickup) and 1 Master Tone topped with Epi Black “Top Hat” knobs with metal inserts. The all-metal toggle works as it would with a 2-pickup guitar with the rhythm position activating the neck pickup and the lead toggle position activating the bridge pickup. The middle pickup can be used in any position by adjusting its volume control. Like all Epiphones, the Custom P93 Blue Royale features quality electronic parts including full-size 1” 500K Ohm potentiometers, Epiphone's all-metal pickup selector switch, and a heavy-duty output jack. The Ltd. Ed. 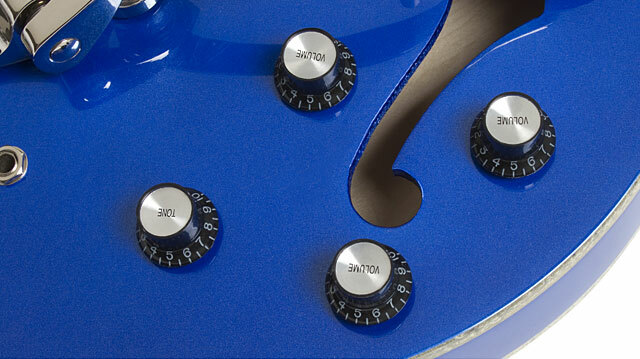 Riviera Custom P93 Blue Royale comes standard with solid nickel hardware. Epiphone vintage style machine heads provide superior tuning stability and accuracy with 14:1 tuning ratio. Intonation is easy to set thanks to Epiphone’s LockTone™ Tune-o-matic bridge plus a legendary Bigsby® B70 tremelo. And the P93 Custom Blue Royale is strung at the Epiphone factory with world famous D’Addario® 10-46 strings. An optional hard case is also available.